We are currently accepting applications from incoming freshmen and sophomores for Learning Commons Service Desk and Library Circulation Assistants for the 2019-20 school year. These are student jobs, approximately 8-12 hours a week. 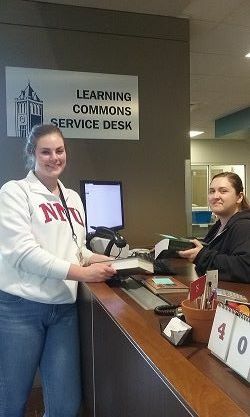 The service desk assistants are the first point of contact for students, staff, faculty and the general public who visit the Peterson Learning Commons seeking information, library materials and/or technical assistance. They serve as members of the Learning Commons/Library staff and the university, providing quality customer service to the end user for all services housed within the learning commons. Preferred candidates will graduate between May 2020 and May 2024, and have a cumulative GPA of 3.5. Hiring will begin immediately and continue until filled (likely mid-summer). Wage: $7.50/hour. Current NNU students should apply through Handshake. Incoming freshmen for Fall 2019 may click here to access the application and return it, along with your resume and a couple of paragraphs telling the Learning Commons staff why you would be a good candidate for the position, to Deanna Wilde, Service Desk Supervisor (dwilde@nnu.edu).